Just look at this crowd. Not a drop of ethnicity. I’m sure only a handful of last names end in a vowel, keeping them safe from the voter purges that the GOP is sponsoring around the country. The more minorities vote, the less likely it is they will win. With the endorsement of Rand Paul, Ted Nugent and Donald Trump, Mitt Romney seems perfectly fine embracing racist surrogates. If you simply read the accounts of yesterday’s Ohio rallies for both candidates (Cleveland) PlainDealer notes that there were “…about 1500 people…” at the rally for President Obama. The very enthusiastic crowd looked like regular, ordinary Americans of every age and ethnic background. On the other hand, the Romney rally speech had an all white crowd of “…about 100 people….” in Cincinnati (according to KnoxvilleNewsSentinel). 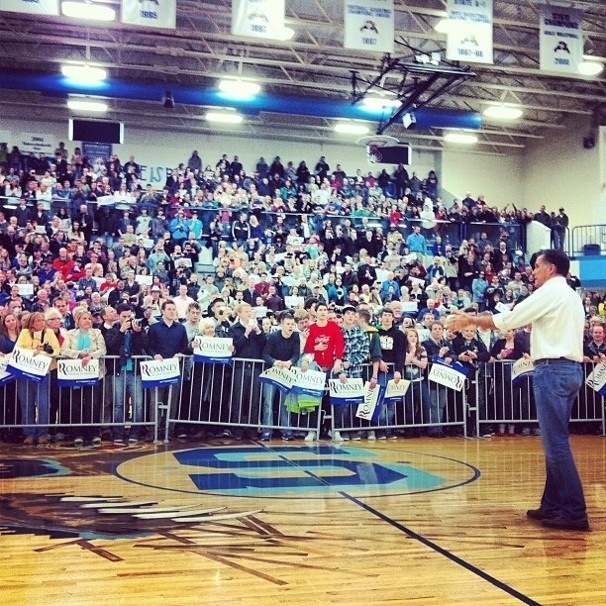 The Romney crowd looked about as enthusiastic as people waiting for a dental appointment. A dental appointment that includes a root canal to be more specific. White supremacy is very inherent in the Book of Mormon. The books of Nephi and Moroni state the inherent supremacy of the white male. Women and blacks are far inferior in their view, which I’m certain Mitt Romney shares. Meanwhile, President Obama is due to grant amnesty to immigrants today trying to implement, amid incredible GOP obstructionism, aspects of the DREAM Act. He’s granting amnesty to 800,000 immigrants who were brought here as children and have lived a lawful life, without the fortune of residential legality, by no fault of their own. Mittens, on the other hand believes in self-deportation. If you were a brought to the USA as a child, without proper documentation, and you’ve lived here for twenty plus years, Mitt believes you should simply get the hell out, voluntarily. Nice, huh? I read a great account of a couple of Latino protestors getting roughed up by Romney’s security detail at a Texas rally sponsored by a company owned by the Puente Brothers. He has a bit of a tough time relating to those other than his superior ilk, according to his scripture. Any dissent has been grossly mishandled and quashed. If it weren’t for small publications like The Daily Kos, we’d never hear about these unpleasant incidents. If Reverend Wright and President Obama’s religion has been called into question ad nauseum in the media, we can certainly bring Mitt’s Mormon-ness to the forefront of our discussion. What’s most egregious is the absolutely racist history of his faith and that should be addressed. Granted, the fundamentalists are cool with his royal whiteness for now because he’s not black, but would they be ok with his LDS beliefs? Would they be cool with the fact that Mormons don’t believe in the immaculate conception of Jesus? Would they be cool with Willard’s belief that he’ll be a god of his very own planet when he dies? Would they be cool with the Mormon desire to posthumously baptize anyone and everyone into Mormonism? I’d say they’ll swallow this GOP medicine reluctantly and rally behind him. Racism seems to be stronger than religious bigotry. I’m sure even the oddities that accompany the Mormon faith are more tolerable to the racists of the GOP. However, it might make them feel icky, albeit less icky than that damned black guy living in the White House. If Romney will run the country, I am sure that not just immigrants, but millions of Americans will want to self deport. I agree, but the voter purge has to be stop. If he wins we all need to find another country.